Environmentally friendly silicone rubber and ABS PC materials, and rubber paint surface process. • Football grain design has anti-skid protecting effect, Compact size design for portability, with the free hook,you may just hang it on your backpack ,when long flights, road trips, hiking, camping easy to carry and charge. 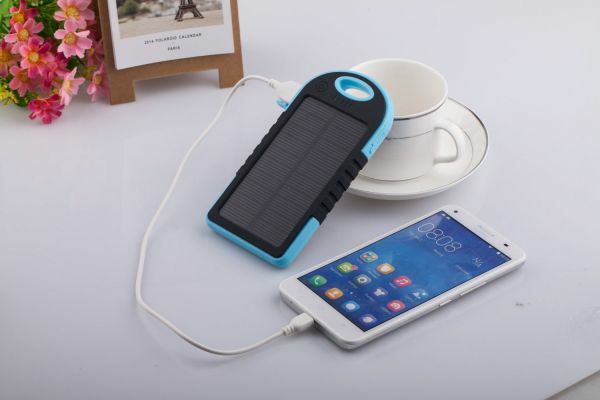 •Solar energy technology, environmental friendly and could recharge itself under sunshine for emergency purpose when outside;Water resistant design ensures the device functions smoothly when it's raining; Shock-proof feature ensures the device working properly even it crashes or drops. • Since the output port is USB, it can be used to charge smartphones, tablets, or any other 5V USB-charged devices. • Compatible with 5V USB-charged devices, 4 LED indicators makes it easy to know how much juice you've got left. Build-in full 5000mAh lithium polymer battery which charges via a powerful 1.2W monocrystalline solar panel. Suitable for charging iPhones, iPads, Android phones, GPS devices, cameras, etc. Good enough for the price! Inexpensive, handy, water and dust proof!